At this week's Mobile World Congress in Barcelona, Nokia Siemens Networks is launching a series of new products, upgrades and services for mobile broadband operators. Areas of focus include its new Flexi Zone architecture for addressing street level small cell deployment challenges. Also as part of its small cells offering, Nokia Siemens Networks will exhibit its new indoor enterprise and public HSPA+ and LTE Femtocells. Qualcomm and Nokia Siemens Networks will be showcasing how operators can get more out of their 900 MHz re-farmed GSM spectrum with Dual Band-Dual Cell HSPA+ that enables higher data rates of up to 42 Mbps. Nokia Siemens Networks will also be showing a VoLTE call running both on a commercially available network and on a virtualized IMS and TAS (telecommunication application server). NSN will demonstrate how the SON (self organizing network) Operations Manager provides detailed views, control, coordination and prioritization for all simultaneously active SON functions while protecting packet core network from load peaks and potentially saving up to 30% in total cost of ownership expenditure. In addition, Nokia Siemens Networks will demonstrate content delivery network (CSN) capabilities for its mobile base stations. Symmetricom introduced a set of Edge Master Clocks for delivering precise time at the network edge, especially in 3G and 4G/LTE small cell deployments. 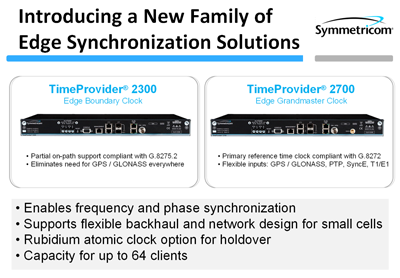 The TimeProvider 2700 and 2300 Edge Master Clocks are IEEE 1588 (PTP) synchronization solutions. In addition to locating a grandmaster clock at or near the edge, the platforms can be used to overlay the network with advanced boundary clocks at specific locations. Support covers both LTE-TDD and LTE-A, which have stringent requirements for frequency and phase synchronization. In frequency synchronized networks (LTE-FDD, as well as 2G/3G), Edge Master Clocks can be deployed to eliminate timing issues caused by the backhaul network and high packet delay (PDV) environments inherent in Carrier Ethernet networks. Multi-sync capability ensures service continuity in the event of loss of one or more of the primary sync signals or the GNSS signal is compromised. The solution is also optimized for deployment in small to large networks with license options supporting between 8 and 64 base stations and/or small cells, allowing for network scalability. Fujitsu Semiconductor Wireless Products has begun commercial shipment of its second LTE multimode product -- a 2G/3G/4G transceiver. The single chip multiband, multimode transceiver supports all wireless communication modes including LTE (FDD & TDD), HSPA+, DC-HSPA, WCDMA, GSM, EDGE, CDMA and TD-SCDMA. The transceiver incorporates envelope tracking (ET) and antenna tuning (AT). Qualcomm introduced a silicon Front End Solution that addresses cellular radio frequency band fragmentation. 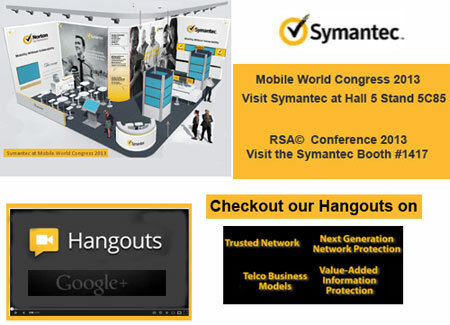 The goal is to create a single, global 4G LTE design for mobile devices. Qualcomm calls band fragmentation the biggest obstacle to designing global LTE devices. There are some 40 cellular radio bands worldwide. The Qualcomm RF front end solution seeks to mitigate this problem while improving RF performance and helping OEMs more easily develop multiband, multimode mobile devices supporting all seven cellular modes, including LTE-FDD, LTE-TDD, WCDMA, EV-DO, CDMA 1x, TD-SCDMA and GSM/EDGE. Qualcomm's RF front end solution includes the first envelope power tracker for 3G/4G LTE mobile devices, a dynamic antenna matching tuner, an integrated power amplifier-antenna switch, and 3D-RF packaging incorporating key front end components. At Mobile World Congress, Huawei and Qualcomm will demonstrate a Scalable UMTS solution that improves spectrum utilization by using a half bandwidth channel. Many mobile operators are looking to re-farm their GSM 900MHz spectrum. However, more than half of these operators own less than 5 MHz bandwidth of contiguous spectrum. Huawei and Qualcomm said their Scalable UMTS helps this movement to spectrum re-farming. Huawei and Qualcomm have successfully completed end-to-end testing of a Scalable UMTS prototype in November 2012 at Huawei’s Shanghai laboratory facilities. The testing showed that Scalable UMTS in a half-bandwidth channel provides the same spectral efficiency as normal UMTS. Scalable UMTS is currently a 3GPP Release 12 study item and will be commercially available from Huawei. Cambium Networks introduced its "GIGATOWER" wireless broadband access solution for enterprise and triple-play service deployments. Based on the Canopy point-to-multipoint (PMP) 450 platform, the GIGATOWER enables service providers to further expand capacity to existing customers and offer high capacity broadband to new customers in urban, suburban and rural environments. The PMP 450's modular design allows the GIGATOWER to provide more than 1 gigabit of broadband capacity and extend coverage area to more than 75 square miles (120 square kilometers). Canopy, which was originally developed under Motorola, has an installed base of four million modules worldwide. "The PMP 450 and new GIGATOWER offer the ability to deploy in greenfield locations or to overlay existing DSL footprint with a solution that delivers HD video and IPTV, voice and data services at a cost point that truly changes broadband economics," said Jay Hilbert, senior vice president of Global Sales, Cambium Networks. "We are also introducing an entirely new architecture, the PTP-C ™, (Point-to-Point Cluster) for small cell backhaul among other applications. It's our more than 10 years' experience as the wireless IP market leader and our deep engineering expertise in NLoS and interference mitigation that have enabled us to redefine the function and form factor that will revolutionize how small cell backhaul will be deployed in years to come." 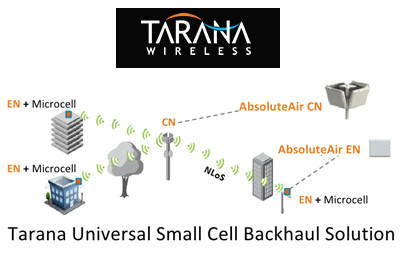 Tarana Wireless, a start-up based in Santa Clara, California, is showcasing its new "AbsoluteAir" wireless backhaul solution for supporting small cell deployments in both non–line of sight (NLoS) and line–of–sight (LoS) operation. Tarana features a unique Concentrating Multipoint (CMP) architecture that delivers a full 75 Mbps backhaul capacity to each small cell and enables the number of links to scale as data demand grows, without degrading per–link capacity. The AbsoluteAir product line consists of Concentrator Nodes (CNs), End Nodes (ENs), and an Element Management System (EMS). Each EN connects directly via Ethernet to a small cell providing it with a full 75 Mbps dedicated backhaul capacity. The CN aggregates links for up to four ENs providing 300 Mbps capacity in a single 10 MHz channel – delivering spectral efficiency of 30 bits per second per hertz. A CN may be co–located with a macro cell where direct access to high capacity connectivity to the carrier’s core network is readily available. By leveraging existing carrier sites for CN installations, significant ongoing operating cost benefits are realized. Tarana leverages advanced signal processing algorithms to optimize link performance. The company says it is able to deliver the full data rate on every link even in dense small cell deployments at a range of 2–4km in NLoS, and practically unconstrained in LoS operation. Tarana's AbsoluteAir antenna has a 100° aperture that dynamically aligns, eliminating time–consuming alignment during both setup and ongoing operation. The company says this enables deployment of individual nodes in just 15 minutes. “AbsoluteAir was designed to meet requests from global carriers for a cost effective backhaul solution that could be easily and quickly deployed anywhere and everywhere across a metro area, without compromising on performance or scalability. I am happy to report that recent urban network tests confirm that our target specifications have been achieved” said Sergiu Nedevschi, executive vice president, chief product officer, and co–founder, Tarana Wireless. Boeing has acquired CPU Technology Inc.'s Acalis business, which supplies microprocessors containing unique hardware and software for security purposes. Financial terms were not disclosed. Acalis will be integrated into Boeing Military Aircraft's Global Strike division. The Acalis business employs approximately 40 people and is based in Pleasanton, California. "Acalis provides security-on-a-chip that can help defend the manned and unmanned aircraft we build at Boeing today and in the future for customers around the world," said Chris Chadwick, president of Boeing Military Aircraft. "With these processors onboard, warfighters can complete their missions and not be sidelined by malware, cloning and other cyber threats against the aircraft's systems." Acme Packet and China Mobile are demonstrating TD-LTE applications, including HD video, using Acme Packet’s Net-Net SIP Multimedia-Xpress (SMX). Acme Packet’s Net-Net SMX consolidates several IP Multimedia Subsystem (IMS) functions into a single network element, simplifying IMS architectures. This enables next-generation services, such as voice over LTE (VoLTE) and Rich Communications Services (RCS).